Bangkok, 7 September 2018 – The United as One thank you banquet for rescuers of the Tham Luang Cave 13 took place yesterday in a cheery atmosphere with those who helped save the Moo Pa Academy youth football team’s 12 members and coach meeting with the grateful survivors. The Thai and international meal took place in front of Dusit Palace and was attended by rescuers from both Thailand and across the globe. Prime Minister Gen Prayut Chan-ocha kicked off the proceedings by paying tribute to His Majesty the King, who for the 18 days of the incident closely followed developments, expressed concern and sent aid. His Majesty issued instructions during the rescue operation for all those taking part to be mindful while also providing them with equipment from the royal household and graciously donating other necessities. Afterward, the PM thanked all who took part for their sacrifice, saying the mission was a reflection of the power of unity and cooperation both among the Thai people and with the international community. He said the selfless acts seen during the event will be case study for rescues in the future. Attendants then received a copy of His Majesty the King’s written thanks to them in front of an image of His Majesty. A representative of the Tham Luang Cave 13 addressed the banquet, thanking all for helping the team members return home safely and expressing deep appreciation to all the Thai and foreign people who sent them encouragement. He said the team intends to live their lives morally, to be good children and students and to grow in good citizens. Ma-ann Konglao, a member of the bird’s nest harvesting team that joined in the rescue operation, made known his Libong team has become better known since its participation in the mission, saying while the experience was demanding it was valuable and helped bring together the Thai people and the international community. 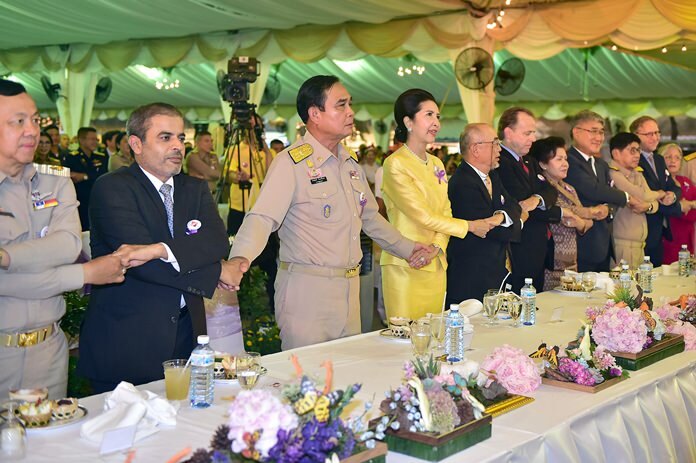 Gen Prayut spent much of the banquet meeting with each attendant before they all watched a musical performance by Mahidol University. He remarked the event was to show that unity and cooperation are borderless and transcend religious creeds. It was concluded when all participants joined in singing the royal anthem.